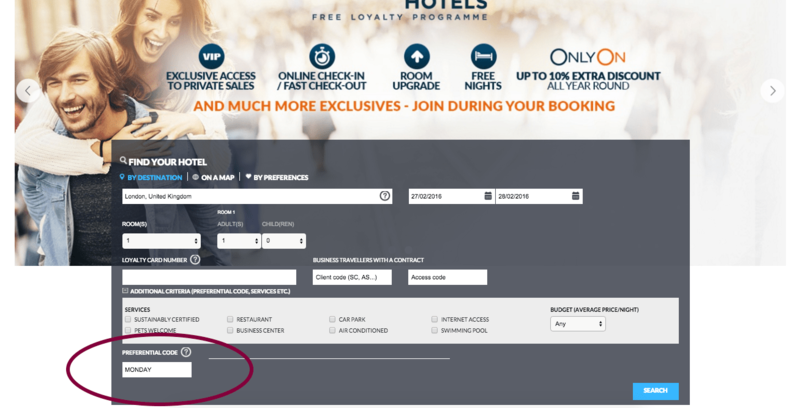 I have written about the “Happy Monday” promotion from Accorhotels a couple of times last year. This is just a reminder that it is still going on and it is a great deal if you are looking to book weekend stays. Happy Monday is essentially a promotion running Monday and Tuesday by Accorhotels for stays booked for the upcoming weekend (Friday to Sunday). Rooms start at £25 for Ibis, Ibis Budget, £40 for Mercure and Novotel with some cities offering the more high end Mc Gallery for £60 or £90 per night. In London some excellent properties like the Pullman hotel St. Pancras costs £90 which is a great deal for a weekend away in central London. You can regularly find the Ibis Earls cost for £40 and Ibis Heathrow for £25. Unfortunately the offer is only available for Accor properties in the UK. It is pretty easy to book and see what is the availability for the location you want. You just have to visit their main website and under additional criteria to type the “MONDAY” code into the preferential code box. I have used the happy Monday option many times and I have to say this is an excellent deal. Especially for a short weekend away in half term, to visit another city in the UK or just an airport stay before your flight. One of the best things also about this promotion is that on top of the low prices you can also receive cashback from Topcashback. You can get up to 10% cashback and with some regular offers from Topcashback and Accor this can reach up to 15%. Last time I used them I received £2,5 for my £25 stay bringing the cost down to £22,5. Not bad at all.